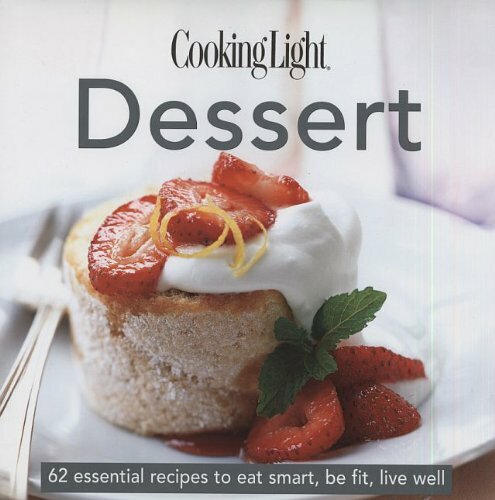 If you only have room for one light dessert cookbook, Cooking Light Desserts is a good one to have.As others have alluded to, its small size does not mean that it is lacking in recipes.Rather, its size is more of an indication that it has been well edited to include only the best recipes from Cooking Light's pages.What you'll find is a comprehensive collection of classic recipes as well as some with more unusual flavors.In other words if you need recipes for things like pumpkin pie, lemon squares, oatmeal raisin cookies, banana pudding, strawberry shortcake, and fruit cobbler they are all here.I can't think of a single standard dessert this book doesn't have. Beyond the comprehensive nature of this book another asset is the abundance of color pictures.You get a picture for each recipe, which isn't common in all cookbooks, but really helps to inspire the imagination and give you an idea of what the end result should look like.I love this because it makes the cookbook enjoyable to browse through. The only thing that could have made this cookbook better would be increasing the size of the cooking class section which includes tips on stocking your kitchen, tips for measuring, and essentials for making staples like layer cakes and pastry.I would love to see even more tips on how to lower the fat in baking recipes in general for when I am trying to give my fattening recipes a makeover. That small nit aside this is a fabulous book.I recently lent a co-worker my best baking books and this was one I gave her along with Martha Stewart's Baking Handbook. I love this entire series by Cooking Light!I love the pictures and easy to follow recipes!I often make these desserts when entertaining, and no one knows that they're light! 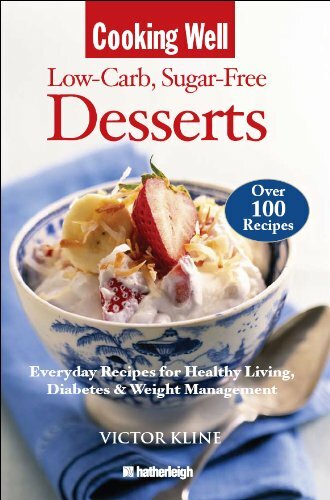 As has already been said in the previous review, this book is definitely a keeper for those who aren't necessary concerned about extreme low-fat/low-calorie recipes but would like to "lighten" the desserts you eat.These are awesome recipes and very tasty! !I haven't tried them all yet but what I have tried has come out really good.I definitely give it a 5-star rating!! Indulge yourself in these "Essential" desserts that don't taste light. I can't believe no one has commented on this book yet. It has the creme of the crop from years past, all with beautiful photos of the finished recipe. So far I have made: Double Crust Apple pie, Texas Sheet Cake, Pecan Pie, and the New York Cheesecake. All of them have been absolutely delicious, with easy to understand directions and ingrediants that can be found just about anywhere. There are many more that I have marked to try yet, in fact thumbing through the book I find very few recipes that don't make my mouth water. Also included throughout the recipes are little tips and suggestions to help the beginner and more advanced cooks alike. Included in the end of the book is some general guidance describing various kitchenware and baking techniques. This would definately be helpful for the beginning cook. I would have liked to see a section that shows you how to take a recipe and lighten it up. However, take any of these recipes and search online for the full calorie version and it's not too hard to see where they make their changes. What you may not find: Low carb dieters or people with diabetes probably would be best to look elsewhere. Cooking Light doesn't necesarily shy away from sugar, flour, or other carbs. Conversely the recipes frequently aren't low fat either. A lot of the recipes use small amounts of full fat butter and even occasionally shortening. If this scares you, you can pretty easily adapt the recipes to fit your diet (probably sacrificing some taste). This book focuses more on great taste and portion control. All the recipes have reasonable caloric levels, but sometimes there portion sizes are a little small, so if you worry about that "just one more bite" mentality... the recipes in this book could be dangerous. Myself, I portion everything out for the week. If I cheat early in the week, come Friday I am going to regret it because I won't have anything to eat. The book is beautiful.But I was looking for recipes that used mostly honey, maple syrup, or molasses.She loves using maple sugar and uses it in tons of recipes.I think maple sugar is too much like sugar and don't want to use it.I haven't made one thing yet because I don't have any of the things on hand to use. 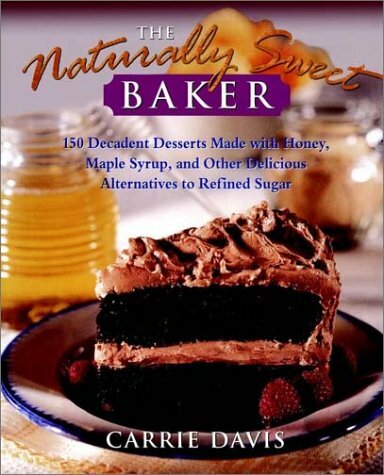 This book gives information about alternatives to refined sugar.It is a very good book with excellent recipes (from simple cookies -the chocolate shortbread sounds terrific- to cakes and ice creams.But, something important, be ready to buy or order (there is a page of sources.Fantastic!) "Sucanat" or "maple sugar", "rice syrup" or "maple syrup".Because if you do not have these on hand, you cannot try the recipes.There are also some recipes with honey, an ingredient that is easier to find. Most of the cookbooks I own come with the appliances I buy. This book is an exception. I enjoy the flavours of maple syrup and honey and was delighted to find a cookbook that caters to my tastes.I find the recipes easy to follow. I'm not an expert in the kitchen. Beside each recipe is a margin where the author has put some notes and room enough for you to enter any notes you may want to as well. At the end of some recipes are tips that give you a clue as to what to expect if you've never had the experience of, "Carmelizing Maple Syrup", for example. Another tip I really liked was the suggestion of using a variety of apples in my apple pie. That was a tasty surprise.The Pastry recipe, which she credits to Julia Child, is the best I've ever had. If you are a chocolate lover, try Aunt Josephine's Chocolate Cake. It's heavenly. I find the author's approach to the reader to be like a personal tutorial. It's like she's right there watching over and encouraging your every move. I haven't tried all the recipes yet but I'm getting a little braver as I tackle the standards: date squares, brownies, pies, and cookies. Thank you Carrie Davis for the "Naturally Sweet Baker". As a professed chocoholic I was prepared only to savour the chocolate recipes in Carrie Davis's The Naturally Sweet Baker. But to be fair, I didn't restrict myself to those, although there is an ample supply. And I have to admit, that Davis's Maple Mousse is just about the nicest dessert I have ever made or eaten! And my guests raved about it too. 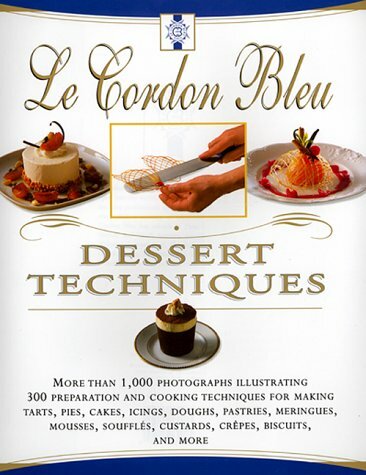 For the first time, the chefs and instructors of the world-renowned Le Cordon Bleu cooking schools have written a cookbook that will teach anyone, from novices with a sweet tooth to expert bakers, how to prepare beautiful and delicious desserts at home. Hundreds of techniques are explained in step-by-step detail, with more than one thousand color photographs illustrating the experts methods for success. Even if you've never made a sugar syrup or rolled out a piecrust before, this is the book for you. The simplest of techniques, typically left out of most cookbooks, are covered in the greatest detail. When you've mastered the basics, Le Cordon Bleu Dessert Techniques will challenge you to make increasingly difficult recipes on your way to preparing dazzling desserts. For example, upon mastering the basics of grating, chopping, melting, tempering and piping choclate, you'll want to try your hand at creating choclate ribbons and culs, marbleized chocolate slabs, and lacy chocolate cups for truly spectacular presentation. Once you've reviewed the techniquws for baking perfect cake layers, you'll be reday to creat a Chocolate Chestnut Roulade or the classic and decadent Sachertorte. This book is great, especially if you are an experienced chef. Being new to the chef field I found it a little over my head. As I gain more experince I find it more useful. I can just sit and look at all the pictures and feel just as satisfied as if I had eaten them. This a beautiful book with good pictures and recipes for desserts of all kinds.I enjoy reading and using this book. Due to "A Customer"'s review, I tracked down Ultimate Cakes.A few pictures are similar, but are not the same.Bogus reviews don't help!If anyone knows of a better ILLUSTRATED book of techniques, please post.This is inspiring for visual learners.I haven't found a better illustrated dessert techniques book. If you are counting your carbs, diabetic, or just trying to cut back on your sugar intake, you have probably been craving the forbidden foods: cakes, pies, cookies, ice cream, and other desserts. Now, pastry chef Victor Kline has created over 100 delicious recipes to satisfy the sweetest tooth...even yours! One of the great culinary dilemmas facing dieters and diabetics is the question of appropriate desserts. Enter pastry chef Victor Kline's "Cooking Well: Low-Carb Sugar-Free Desserts: Over 100 Recipes for Healthy Living, Diabetes, and Weight Management", a 176-page cookbook compendium showcasing more than one hundred step-by-step, 'kitchen cook friendly' dessert recipes specifically appropriate for diabetics and dieters. The delectable dishes range from Almond Delight Spritz Cookies; Blueberry Muffins; Low-Carb Cinnamon Buns; and Chocolate Peanut Butter Cake; to Bake-Free Cherry Cheesecake; Pumpkin Pie Dessert Cups; Vanilla Praline Pecan Torte; and Banana Mousse Supreme. Of special note is an entire chapter devoted to toppings and frostings! From ice cream and other frozen treats, to fudge, chocolate, and candy delights, "Cooking Well: Low-Carb Sugar-Free Desserts: Over 100 Recipes for Healthy Living, Diabetes, and Weight Management" will prove to be an enduringly popular addition to the cookbook shelves of anyone having to deal with diabetes and weight management issues. I received this book as a gift, and it was one of the best presents I ever got! Love the recipes, and the "easy to put together" cooking.You want to use it, and then "just spin through" to see what else you can find. PS - No relation to the author! Since my Mom and Mother-in-Law both own this book I was very concerned over the negative review....until I did my homework. Being apprehensive over the carb count I did an estimate on random recipes in the book like the Raspberry Wafer Cookies (mmm) on [...] and I found my rough est. results to be quite reasonable to the book.I found ONE recipe that features a cup of sliced bananas.And as far as "low-carb"...yup, I'd consider 24g/C Splenda (recipe only calls for ½C) compared to 192g/C of sugar is pretty significantly low-carb in my book. The author mentions several artificial sweetener conversions...not just Splenda. He also mentions the maltodextrin filler on pg. xiii in his book and, yes, you can buy "straight" Splenda...it's called liquid Splenda.([... ])Also, the packets contain less "filler" (maltodextrin) than the bulk as well as Splenda with fiber.If you're counting every mico-gram of carbs there are options to bulk Splenda.I also found that the FDA has approved Splenda for diabetics on [...] in the diabetes section.So that being said, I'm very glad my family has a healthy, as well as a yummy, delicious, alternative to making high fat/high carb desserts.My homework is done! I bought this book because the author had been a pastry chef, and I figured he would know how to make desserts taste good. He may well know that, but he doesn't know ANYTHING about nutrition. Although he includes carb-counts for every recipe, I think he must have pulled them out of thin air, as they bear no relation whatsoever to the actual number of grams of carbohydrate in the recipe in question. Furthermore, to call these recipes "low-carb" is ludicrous: No recipe that features a cup of sliced banana (31 grams of carbs) per serving, plus sweetener, etc., is a good idea for diabetics or dieters or anyone who is trying to limit carbohydrates. Finally, Mr. Kline appears to believe that both Splenda and (astonishingly) the Splenda-sugar mix that is currently on the market, are free of carbohydrates. Sure, Splenda itself is carb-free. But you can't buy straight Splenda; the company markets it mixed with maltodextrin, so that it will measure like sugar, and that gives it a carb count of roughly 24 grams per cup. When a recipe calls for 3/4 of a cup of the stuff -- to serve two -- those babies are going to add up quick. As for the Splenda-sugar combo, hello? What part of "sugar" do you not understand? Though constantly pressed for time, moms want to bring something homemade to the table--"Dessert Express "allows them to indulge their family and still get to soccer practice on time. Mother of two and former pastry chef Lauren Chattman is here to save the course most people crave. Molten Chocolate Cherry Cake, Homemade Mallomars, Bourbon Brown Sugar Fudge, and other tantalizing treats are among the 100 from-scratch recipes that just about anyone can prepare in a half hour or less. Her secrets? 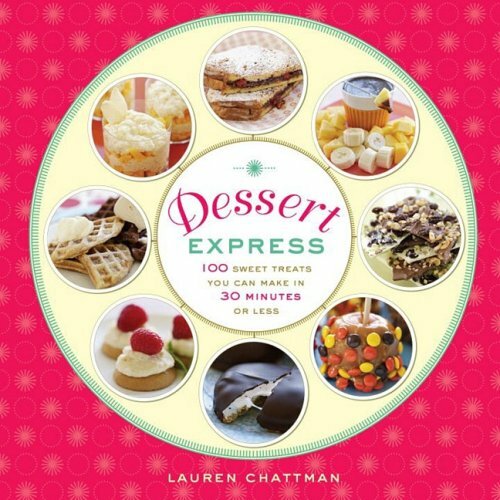 Dessert Express offers 100 deliciously indulgent recipes to satisfy your sweet tooth in 30 minutes or less. This book came right on time, as they usually do. If you like quick little desserts that are easy to put together... this is the book for you. I found that just about anything you want to make in this book will require ingredients that you will probably have hanging around in your pantry any way. Great for entertaining! Good book at a good price. I would say that this is not just for entertaining. If you are a working mom and like the idea of putting dessert on the family dinner table, these are so easy to do, that even the kids can help out and you will all have dessert in a flash! I'm a cookbook writer but I don't write too many dessert recipes. Normally because they take A BUNCH of time. This book proves me so wrong. I am now able to write my own .. 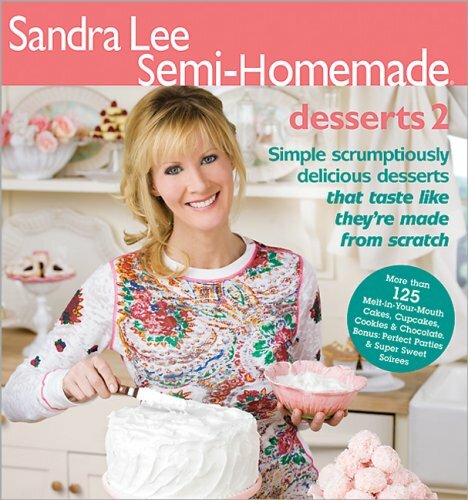 It's excited and fun.. and easy and this book is a must if you need to make some quick deserts.. If you're lactose intolerant, avoiding cholesterol, limiting saturated fat, or simply crave sweets, prepare to indulge. 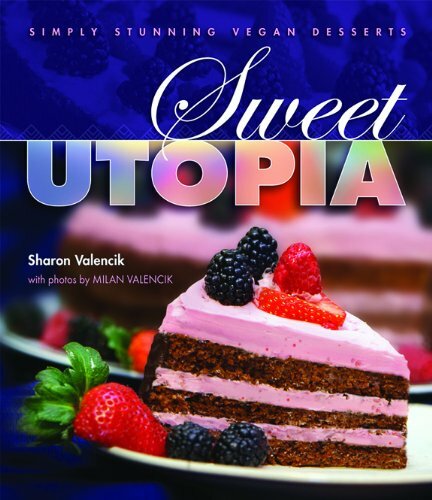 Author Sharon Valencik demystifies the art of vegan baking and expands your culinary repertoire to include delicious dairy-and egg- free desserts for all your celebrations. Over 130 recipes for decadent cakes, scrumptious cookies, creamy cheesecakes and pies, velvety mousses, puddings, and crÃ¨mes and other luscious treats are accompanied by mouth-watering photographs that provide inspiration and are a feast for the eyes. These desserts capture the same delicious flavors and textures of traditional favorites. As a bonus, because they do not contain dairy or eggs, they are cholesterol-free, have little saturated fat, and leave a smaller ecological footprint. For the inexperienced baker and busy moms, these recipes are ncomplicated to make. Sharon's clear instructions and expert tips blended with everyday ingredients that can be found in a supermarket magically makes egg-less cakes rise, creates rich, creamy fillings without milk or cream, and cookies that have rich flavor and moist texture without the use of butter. Omnivores of every persuasion will love the sensational tastes and appreciate the discovery of healthier dessert options. Some of the recipes that will amaze guests and delight families include Midnight Cake with Chocolate Frosting, Ice Cream Cookie Sandwiches, Coconut Tiramisu, Mixed Berry Cheesecake, Gingerbread Guys, Chocolate Mousse, Lemon Berry Tart, Fudgy Chip Cookies, Cappuccino Custard, Pudding Parfaits, and Three-layer Cheesecake Bars. I loved this cookbook!It introduced me to a world of flavors thatI had previously been unfamiliar with..With a wife who is a dietician, I am used to eating flavorful healthy food, but this cookbook really takes the cake.I really enjoyed eating the desserts, but the book is really a feast for the senses, incrediblephotographyand easy to understand and educational recipes. A wonderful way to live a kinder and healthier life.Highly recommended! My family has absolutely loved every single thing that I've made from this cookbook.I'm not one to shy away from trying new things in a quest to eat healthier, and I don't give up when I try something that doesn't work.I've made plenty of recipes over the years that were not "keepers" to be sure, but that is not a worry with Sweet Utopia.The author of this cookbook is a total genius, everything comes out stunning and tastes great.I have yet to find a recipe that's a dud in this batch.She must have the chemistry of vegan baking down to a science because it works.No cholesterol, no dairy or eggs.The included photos are brilliant, which is always a big plus for a cookbook.If you don't want to experiment and hope your dessert might work out or might taste alright, don't mess around, get this book and you can't go wrong. Possibly the BEST DESSERT BOOK AROUND! The best dessert book ever! What's amazing about Sweet Utopia is that the recipes are both easy and delicious! I made the ultimate brownies for a party with plenty of non-vegan friends there, and they were amazed that there was no butter or eggs in them. And the photos are spectacular. It is really a gorgeous book.I recommend it for anyone wishing to make spectacular desserts. Those yearning to create more healthy treats will learn how to bake without the fats and hydrogenated oils found in common dessert recipes with this lavishly illustrated cookbook. 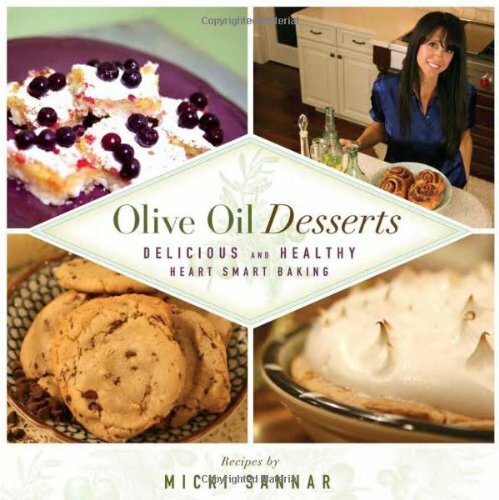 Designed specifically for baking with olive oil, the recipes eliminate key ingredients—butter, hydrogenated oils, margarine, and shortening—that are staples in many traditional desserts. In addition to household favorites such as toll cookies, brownies, and apple pie, the cookbook features instructions for making more than 60 mouth-watering treats, among them chocolate chip buttermilk cake, silky cheesecake with strawberries, lemon sugar cookies, pecan coconut bars, and apple cinnamon rolls. Hints such as using egg substitutes and other ingredients to further lower cholesterol intake, substituting lactose-free options for those suffering from milk sensitivities, and a guide to the many varieties of olive oil are also included. If you want to lower your cholesterol but not give up sweets, this book is for you. It's not just sweets, but breads, scones, muffins, pie dough, etc..But beyond that, if you have food allergies or cook for someone who does, this serves double duty.The substitution charts in back allow you to swap out eggs (sev'l choices for sweet or savory substitutions) and dairy (even buttermilk) easily. You also have a conversion chart to use w/your previous recipes by swapping out high-cholesterol butter or margarine with olive oil, thereby making the desserts healthier and even lighter b/c the olive oil to butter ratio is less.I made Lemon Sugar Cookies and swapped out the one egg (b/c my toddler granddaughter is allergic) with 1/4 cup of applesauce. They were cookies we ALL could eat, they looked exactly like the picture, were delish, and received raves...better than a bakery. The book is esthetically beautiful to look out, makes a good gift or coffee table book; but this one will most likely take up permanent residence in my kitchen! Olive Oil Desserts has some interesting options. I haven't tried any recipes yet, but what I've seen looks good. The book is in great shape, and was delvered quickly thru Amazon for a very reasonable price. I know olive oil baking might sound unusual. I thought so too. However my dad used olive oil in a boxed chocolate cake and it was wonderfully moist. I've tried 2 recipes already and I'm in LOVE! Both desserts came out extremely delicious and they were very easy to make. I like how organized this cookbook is. It has substitution charts in the back. The pictures on this book are beautiful. I can't wait to try more recipes. My husband and kids really enjoyed the 2 recipes I made that they can't wait till I make some more. I've only made the "ginger roos" and they were very good!The rest of the desserts look like they will be great too, I can't wait to try them!The only drawback is there is no nutritional information with the desserts.This would have been a bonus for calorie counters. Finally a way I can eat all the dessert I want!! You can have your cake and eat it too with Ani Phyo’s innovative, delicious desserts. From cobblers to cookies, pies to cupcakes, Chef Ani’s easy-to-make sweets are wheat-free, gluten-free, dairy-free, processed sugar-free, and cruelty-free. Deceptively simple, these treats pack loads of flavor and nutrition in every bite. Substituting these mouthwatering desserts for traditional baked ones will give your body much-needed nutrients while sacrificing none of the flavor. With lists of essential tools, key ingredients (including superfoods” that enhance flavor and nutrition), full-color photos, and gorgeous design, Ani’s Raw Food Desserts proves you don’t have to sacrifice taste or style to reap the benefits of raw foods. This book is awesome! Since my wife got the book I have nothing but enjoyed every single dessert she makes based in this book. I absolutely recommend it! No doubt. Easy, accessible, fun, and delicious! This book is fantastic. When I first starting getting into raw, it was quite intimidating and it felt like I never had the right ingredients. I love this book because the ingredients are always simple and the recipe is always easy to assemble. I like that she tries to have all her recipes using the fewest appliances as possible and tells you what's optional and what can be substituted for convenience. As for desserts, all the recipes are great. Lots of ideas for combinations and recipes for simple essentials like different sauces youcan add on anything you want. Everything I've made so far has been delicious and completely satisfies my sweet tooth without me feeling guilty! Amazing Desserts!!!! Quick, Easy, and HEALTHY! Fruit desserts are my favorites. I will take a fruit-based dessert over chocolate or cake any day. I was very excited to get this book, but it has been a let down. I have tried a handful of recipes and overall they have been bland and disappointing. Somehow each recipe's flavors are muted - neither tart nor sweet, and these are the flavors that make my heart sing in a fruit dessert. The recipes are just ok - except for the Cherry Almond Bars. Those were just like eating cardboard. The recipes are not difficult, but it's clear the authors were writing from (and for) a Northwestern (US) perspective. Some of the ingredients are extremely difficult, if not impossible, to acquire for those living in other areas of the country, especially the berries. I just have to skip recipes calling for tayberries, marionberries, loganberries, or sour cherries. Even if I could find such fruits locally, I suspect they would be expensive, and with the results I've had thus far, I would regret wasting money on mediocre results. The introduction is great, providing definitions for the various desserts. Similarly, the introduction to each season's desserts contains handy information about the featured seasonal fruits. I also really liked the organization of the book. Grouping the desserts by season was really smart and fun. I just wish the desserts actually tasted good! Every receipt I have tried, I LOVE!I really like the way the book is broken up to receipts that use fresh fruit in season. The cherry/rubarb is my favorite so far & I didn't even like rubarb before this receipt.I get hungry just thinking about it. This was the perfect gift for a young male who was exploring his baking skills, and didn't really care about making a "pretty" dessert! Desserts are celebratory and provide an emotional as well as physical satisfaction. This collection of recipes for sin- sational sweets can be enjoyed without the guilt. They're all rich in wholesome, minimally processed ingredients and free of chemical additives and superflous fat. Even if you're a novice baker, you'll be able to make rich, moist cakes, delightful cookies, and flaky pie crust--all cholesterol free. Designed as a complete course in dairy- and egg-free baking, readers can still go directly to any recipe; each one is detailed and complete. You'll learn all the tricks of the trade for making and baking : gels, creams, mousses, puddings, and sauces, cookies, bars, little bites, cobblers, crisps, biscuits, muffins, cakes (basic to elaborate), pies and tarts as well as fillings, frostings, glazes, and frozen desserts. GREAT taste, amazing know-how, quality & cruelty-free - for the WIN! To sum up - this book is worth its weight in vegan baking gold. You get an impressive spread of recipes that are not just scrumptious, but reliably sound. You get an education in baking and expert advice on how to work with alternative ingredients. You get a valuable reference book in the kitchen. And you get all this without eggs and dairy. Great taste, know-how, impeccable quality, and cruelty-free - it's a big win all around. Some details: More Great Good Dairy-Free Desserts Naturally, is a dairy-free and egg-free dessert cookbook written by Fran Costigan. Fran is the author of several books and also teaches at the Natural Gourmet Institute in New York City. The book sports a recipe layout that is straightforward and easy to follow, with simple black text that makes it easy on the eyes, and a selection of glossy colour photography. It is 224 pages long and is divided into the following sections: Getting Started; Gels, Cremes, Puddings, and Sauces; Cookies, Bars, and Little Bites; Cobblers, Crisps, Biscuits, Muffins, and More; Cakes, Fillings, Frostings, and Glazes; Pies and Tarts; Fruit, Beverages, Frozen Desserts, and Confections; Bibliography and Reading List; Resources for Ingredients and Equipment; Organizations and Publications; and Common Weights and Measures. In the kitchen: For the purpose of writing this review, I chose to bake up the Big Orange Bundt Cake (just like my mum used to make - beautiful crumb, super moist, and buttery without the butter), the Super Fudge Low Fat Brownies (super fudgey, moist and chewy, beyond decadent - the best brownies I've made so far), and the Pumpkin Pie (perfect - so much so, it did not survive long enough to be documented on film). In fact, I am quite familiar with this wonderful book, having previously made the Good Cornbread (I love that it's more savoury than sweet - and the optional slathering of organic maple syrup on top makes for a beautifully balanced contrast of sweet and savoury), the Chocolate Chip Cookies (wonderfully thin, sweet and chewy), the Coconut Cloud Layer Cake (a beautiful, fancy cake - no wonder Fran makes these as wedding cakes for lucky friends), and accompanying Island Coconut Cream Filling and Frosting (so good, you can eat it with a spoon - and I did). I have never been disappointed baking from this book. 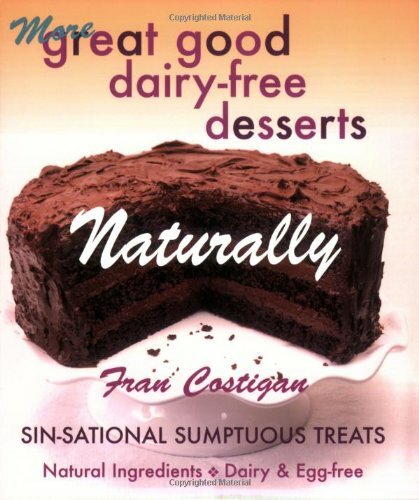 Fran is truly a master - not only do her sweet inventions taste amazing and brag fabulous texture and appearance, they're also filled with the best ingredients: Fran eschews the highly processed stuff and champions quality, organic, and natural ingredients. I appreciate that. So we've established that these treats taste incredibly good and bake up reliably. But you get a lot more than just an impressive spread of fine desserts - you're also benefiting from Fran's years of baking expertise. This book boasts page after page of information, including tips and technique tailored to each section of the book, as well as detailed descriptions of ingredients and thorough explanations on how to use them properly. Did you know you can remove the beany-ness of firm tofu by blanching it in boiling water before using? Fran taught me that. Did you know that you can easily get a stubbornly stuck bundt cake to smoothly descend by draping a hot, wet tea towel over the tin? Fran taught me that too. Fran's explanations on how to work with less common ingredients like agar agar and kudzu is priceless. I find myself coming back to this book time and again for reference on how to work with often tricky ingredients - it's that useful. I haven't actually made any of the recipes yet as none of them initially appear appealing. Prize-winning coffeecake and much, much more! I have been enjoying this book for almost two years now. The first chapter provides an excellent overview of the different ingredients and sweeteners that can be used in vegan baking and is a good reference to have on hand, for both beginners and more experienced bakers alike. And the recipes are divine - in particular, I have made the un-coffeecake recipe dozens of times, and people cannot believe that it is vegan. Just this week, I entered a version of this coffeecake in our local county fair, and it took 1st prize. More proof that vegan desserts can 'take the cake' even in rural America. Other stand-outs from this cookbook are the blueberry slump (I've made the cranberry version), the grape tart in the cornmeal-pinenut crust, and the ultimate chocolate sauce. Oh, and the biscotti. And the scones. I could go on. Highly recommend this book. Note: there is a reliance on soy in a fair amount of the recipes. I have subbed alternate milks (almond, hemp, etc.) and the recipes have come out great. For the recipes calling for tofu (primarily puddings/mousses and frostings), I have looked to other recipes as I can't get tofu easily where I live. But these are a small percentage of the recipes in this book, so it is still well worth the investment even if you don't/can't do soy. Happy baking! If you're looking for easy-to-make (and somewhat healthy) desserts, this is the book for you, especially if you're interested in vegan baking. I love the recipes and highly recommend this book. My teenage daughters are very excited to try making the desserts in this book.The girls already made the Malted Milk Ball Cookies and the Malt Shop Pie.The recipes were clear and easy to follow and the results were absolutely delicious. I think all teen cooks will find the recipes in this cookbook appealing. I bought this book (along with Teens Cook) as a gift for my two teenage cousins.Before wrapping the books, though, I spent some time looking through them.If the books had been around when I was a teen, I would have loved to have had them.As it is, I still may buy them for myself! The book is filled with recipes that teens and young adults would actually want to eat, which is better than a lot of standard cookbooks.The pictures are great because they show every recipe. I also enjoyed the casual tone of the book, since it is also written by teens, it is not condescending towards them.I look forward to more cookbooks from these two young women. Teens Cook Dessert is one of the best cook books out there!I'm a teen myself (16 years old) and have read countless recipes and more cook books than I can count on both hands. This cook book is concise in its instructions, accurate in its baking times and pan sizes, has an amazingly wide range of delicious recipes of various difficulty, and includes helpful tips and fun facts scattered throughout. The one and only thing that I would include in this book is preparation times for the recipes (its rather annoying to begin a pudding and later realize halfway through that its going to take 5 hours to finish...).This book is appropriate for both the beginner and the seasoned kitchen veteran. Gave this book to my 11 year old... great to have fresh baked goodies these past few weeks! Wonderful book design, my daughter loves the funky "messy kitchen" images. In one recipe my daughter and her friend did not understand clearly that they should mix the flour AND baking soda together first. They added the flour and after mixing with the wet ingredients added the soda. Some advanced baking knowledge and experience is needed. Deborah Madison, author of the bestselling Vegetarian Cooking for Everyone, has enlightened millions of Americans about the joys of vegetarian cuisine. Now, after six books for the savory palate, she's finally introducing us to her spectacular fruit desserts—more than 175 easy recipes that are as delicious as they are healthful. Have you ever bitten into a ripe, fragrant strawberry? Or a luscious peach, its juice dripping down your chin? Or a pear that explodes with flavor? Sometimes fruit, all by itself, just seems like the perfect end to a meal. Now, In Seasonal Fruit Desserts: From Orchard, Farm, and Market, Deborah Madison manages to improve on perfection, turning all of your favorite seasonal fruits into a cornucopia of decadent tarts, pies, puddings, and cakes. Most of us find it difficult to incorporate enough fruit into our diets but with more than 175 recipes in this book, you'll find plenty of new, healthy and totally pleasurable ideas. Dessert doesn't need to be a complicated and time-consuming task after you have prepared a whole meal. These simple and flavorful recipes are easy to master and will delight your family and guests. 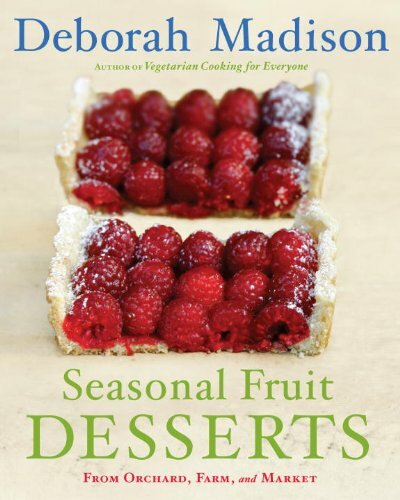 This is a simply excellent book.The seasonal desserts are fresh and exciting!Deborah has a wonderful collection within its pages. This book has so much information in it and the recipes are not complicated. I love a cookbook with pictures and the pictures are just beautiful. This is my summer read along with a few other cookbooks and I am enjoying reading every last word in the book. 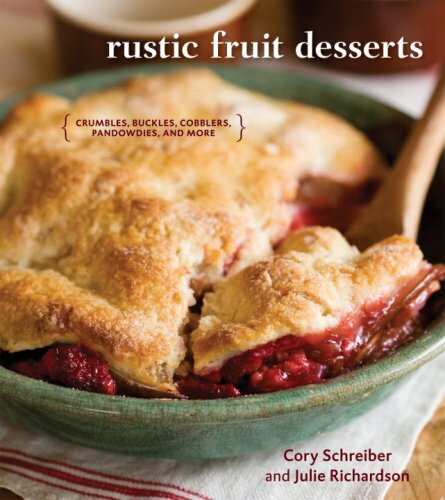 This is now one of my favorite books, I highly recommend it if you love to create fruit desserts. Deborah Madison provides some innovative fruit dessert recipes along with old favorites and variations on those favorites. This book has a scattering of gems - Broken Jellied Wine, Dark Chocolate Pudding to name but two - amidst a lot of good-looking photos (sometimes of the fairly obvious - Chapter 2 with its list of fresh fruit you can eat for instance. )If quality paper is your thing then this weighs upon the fingers too.So all in all I suppose there is just enough here to merit the purchase price (and, to be fair, I ought to re-visit again to be absolutely sure so I'm rushing to judgment somewhat) but I wonder if this will ever be one of those indispensable cookery books? Transporting readers to three of the most romantic cities in the world, this beautiful book brings to life their old-world charms and architectural gems, and presents 150 impeccable recipes for recreating their legendary cakes and pastries in the home kitchen. Vienna, Budapest, and Prague have a special hold on our imaginations, conjuring up a sense of timeless elegance, of historical and cultural riches–and of tables laden with the most extraordinary desserts imaginable. 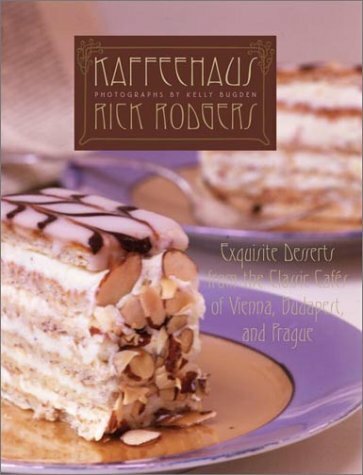 Rick Rodgers explores all these treasures in Kaffeehaus, a cook’s tour enhanced with stunning full-color photographs. Rodgers visits such culinary landmarks as Café Slavia in Prague and Café Sperl in Vienna, sampling apple strudel, the Emperor’s pancakes, hot chocolate, and other classics and gathering the recipes (and secrets) of master bakers. With an attention to detail developed through years of teaching, he explains how to make the perfect accompaniments to a cup of coffee, as well as spectacular endings to elegant meals. I have come to the conclusion that any cookbook in which the recipes origin are from any food service or in this case a Kaffeehaus I will not buy it. No food service business would ever freely give old, traditional or family recipes away. As a pastry chefwe change the recipe so that the customers think that they are getting the original one.I thought that maybe since the book was based on the kauffeehauses in Vienna, so far away, that there could be a chance of some good recipes. Some did work but far to many did not, usually the ones with expensive ingredients. The regular home baker may not know how to spot a bad recipe and some you can not. so "Beware" before you buy it. It's an incredible shame that the publishing company let this book fall out of print because this is a stellar collection of recipes. If you don't own it, check for it at your local library. You won't be disappointed. We were recently on vacation that had us stopping in Budapest, Vienna, and Prague prior to the Christmas holiday and it's such a treat to be able to make some of these pastries and cakes at home. As an added plus, the book is beautifully photographed and is a joy to page through as you decide what to make. Although some of the recipes are complicated, the steps are nicely laid out so it feels perfectly attainable to bring these delightful desserts into your own kitchen. The recipes can be done at home! I bought this cook book before it escalated to the present $90 + dollar price, and I must say, to those of you contemplating buying it now - that it is probably still worth it.I have no culinary background, just a fondness for cooking, and I was able to reproduce the Esterhazyschniten that is featured on the cover of this cookbook, and mine turned out looking almost identical.The history, photos and recipes in the book are fantastic - I have made several now and all yield excellent results, including the Poppy seed cake and the Schniten above and a delightful triple layered cake with walnut, apples and poppy seeds.I gave that one to some other "gastronomes" who were delighted with it.The only thing I am lacking for creating more of these authentic desserts is time; the instructions are thorough, the recipes precise, and the history captivating.Buy the best coffee your grocer provides and create one of these almost heavenly delights.Its almost as good as renewing your passport and going there! I bought one of these for a dear friend in addition to my own copy. I highly recommend this book!I would not hesitate to buy anything from this author, as he is logical and easy to follow.He manages to convey some of the fun that he had in experiencing the coffee hauses for himself.That makes this cookbook diverting. If you can find this book, for a reasonable price that is, get it. This book was done with great love. Reading through the list of ingredients and instructions, I came to realize that these recipes are no easy feat. I fell in love with this book, because it has put to use Farmers cheese which I have come to absolutely love. When your family or friends taste these recipes, they will praise you highly. All your love and labor would have been worth it. As for some of the comments on this book.... There are no pictures in this book, but who cares. You can not eat the picture. You can eat the final product of the mixed and baked ingredients. I don't care for pictures anyhow, as it gives a view from one persons eyes as how it SHOULD come out. As long as you follow the wonderful directions, you will achieve succes in the preperation and the visualization aspect of the dessert. Have patience. Have fun. Experiment. As for the comment of blandness... everyone is different. Add more sugar the next time, or more chocolate or fruit or whatever it is you like. There is no cookbook that exists that meets the needs or wants of every individuals palate. Even in Vienna. While assembling a dessert I sneak a taste here and there and usually I am able to tell what it needs more, or what it needed less of. Once it's baked, I can not do anything about it... Take notes and try again. Also, one should always read a cookbook, especially, before attempting. I never take a book into the kitchen whils cooking, I always write the recipe down on a piece of paper for preservation of the books sake. Since this is becoming a hard book to find, I really want to preserve it. (This is for those who comment on the editing - For which I found no fault). Anyhow, a GREAT book on desserts from exotic lands, to me at least, that I am sure will wow my guests or yours, at the range of our tastes/inspirations. Thanks Rick Rodgers. Lovely book. This is not a set or recipes from the coffee houses of Vienna, Prague or Budapest. These have been altered to fit American tastes in quite a number of instances. There are descriptions in the recipes where the author states this plainly, but he usually DOES NOT give the original recipe or any other indication of what the changes are. Some of the changes may be trivial, or they may be large changes. Who knows without the original recipe ? However, the use of high fructose corn syrup in some of the basic preparations is an indication of the problem. Having tried some of the recipes (I've only had the book for a couple of week so far), the results are quite OK, but I was trying recipes where I knew that they sounded like recipes from some of my other European cookbooks, and not the obviously altered recipes. The lack of the original recipes makes this merely a nice introduction to these great desserts, but not a book to give you a 'true' taste. If you are in the US and an introduction is all you want, then this would be an excellent book, no question of it. Otherwise, there are better books out there. Yet another gift book for young couple building a healthy cookbook library.They love sweets, chocolate, cakes, cookies, etc. and this was a good addition to show there are decent alternatives to Butter, Oil, and more Butter.Not really secrets to experienced low-fat fans, but great for low-fat newbies. I bought this book because it sounded like it would have good receipes. Once I got the book, I didn't find any of them appetizing.A good rule of thumb is if a recipe calls for oil, substitute apple sauce and you'll be cutting the fat.. I know that some fat is good in our diets and I don't advocate eliminating all of it; however I know I personally can eat WAY too much in my desserts.This book has given me tremendous insight into how to reduce and/or cutout the fat in my desserts.The recipes are tasty, moist when they'resupposed to be, chewy when they're supposed to be, crisp when they'resupposed to be (you get the idea - these are not gooey, nasty fatreplacements).I especially like the Prune Puree and have used it inother recipes very successfully.I highly recommend this book as asensible addition to your healthy living cookbooks. A Great Cookbook in General! I've almost never written a review, but I really feel like I should write one for this cookbook to vouch for it. I've tried at least 6 recipes from this book so far, and I'm almost always pleased with the results.Sometimes the the baked goods don't turn out as exactly as I've expected, but they are nowhere near terrible!If you are an adventurous baker/cook who like to try out new recipes, you'd know what I mean.There may be nothing worse than cooking something that's absolute horrid, even if you follow the recipe exactly, and nobody would help you get rid of the food!The recipes haven't failed me yet.From coworkers, friends, to family members, everybody absolutely loves the end results. So far, most the recipes can be easily converted into vegan recipes as well. As a lactose vegetarian (no eggs, but yes to other dairy products), this cookbook is wonderful.Whenever I tried to look for vegetarian recipes/cookbooks that is eggless, I was usually left with vegan or allergen-free options.While these recipes can be great, the recipes often need modifications or call for sometimes strange ingredients.The ingredients in this cookbook are all easily accessible in regular grocery stores. Baked goods in general usually have eggs, so it's difficult for me to buy pastries that the world takes for granted. Whenever I see eggless baked goods, I jump on them.Now, I find myself hunting for buy ready-made baked goods less often, now that I have the bible of eggless baking!It is also relatively easy to modify the recipes for my vegan friends as well.The baked goods are absolutely delicious when I use fresh, organic ingredients. I can't recommend this cookbook enough.Believe it or not, I actually put it down on my emergency packing list in case of natural disasters. This book is the most useful cookbook I own. Most receipes are fabulous and I cook these desserts even when I could bake with eggs. My son is allergic to eggs andI floundered looking around for receipes for his birthday cakes.Now he knows that his cakes are just as good or better than cakes with eggs. I salute Rosemarie Emro for providing us with a beautifully simple functional cookbook that REALLY WORKS. I have about six other cookbooks which in all honesty I should just throw out because I never use them anymore. After having tried some receipes out in some books I'm convinced they've probably haven't pretested most of the receipes. Rosemarie Emro's recepies are fabulous and I just wish I could thank her personally for a job well done! Store-bought cake mix?Why would I need a cookbook for that? Anyone worth it's baker's beans will be offended by the cookbook advocating the use of store-bought "yellow cake" to bake the items listed. If I wanted to buy a cake mix to bake my cake, I would not need the cookbook in the first place. Additionally, if you cook for an allergic child, then the last thing that you want to do is to subject your child to boxed mix packed by who-knows-how in some faraway lands. That said, for a new baker this may prove a priceless treasure trove, but for those of us with a bit of flour behind our ears, this cookbook is a bit too basic and unnecessary. 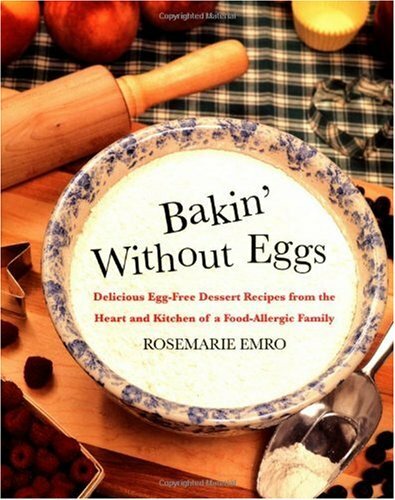 This book has good ideas for egg free desserts.Our family loves the choc chip cookie recipe. 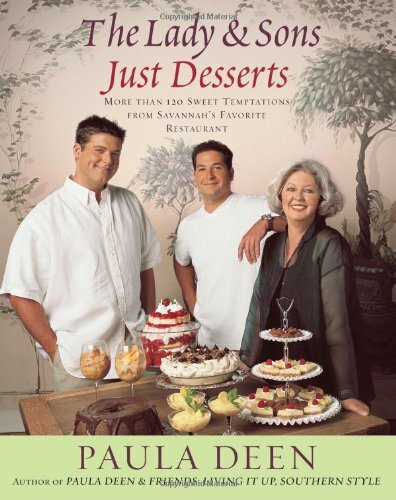 In this beautiful hardcover edition of The Lady & Sons Just Desserts, Paula -- author, restaurateur, and Food Network star -- devotes her trademark southern charm to a tempting collection of more than 120 delightful recipes, guaranteed to indulge any sweet tooth. Whether you're baking for the holidays or an after-dinner treat, there are crowd-pleasers here for any occasion. These are the classic down-home recipes that have made Paula beloved to her fans everywhere, from her signature Gooey Butter Cake and Key Lime Grits Pie to Pecan Shortbread Bars, Hidden Mint Cookies, and Iron Skillet Brownies. Whether you're whipping up an Old South Jelly Roll Cake for a weekday treat or baking the Apple Butter Pumpkin Pie or Christmas Nut Pie for a holiday celebration, these treats are as easy to create as they are to enjoy. The Basic 1-2-3-4 Cake -- in coconut (Jamie's favorite), caramel (Bobby's favorite), or chocolate -- makes a wonderful birthday surprise, and the Tennessee Banana-Black Walnut Cake with Caramel Frosting is a southern favorite sure to become one of yours as well. There is also a wide array of cookies, bars, and candy, including Savannah Cheesecake Cookies, Orange Brownies, Chocolate Brickle, and Creamy Caramels. Even the most time-pressed cook will find it a snap to create these from-scratch recipes, using Paula's tips for reliable convenience ingredients and time-tested shortcuts that will impress and delight family and friends. Recipes contained are ok.I've scanned through the book and there just isn't anything with a "WOW" factor. I enjoyed reading this book and the recipes, some I will use and some I won't. But I thought the book was good. There is one thing I wish Paulas cook books had, and thats more pictures of the finished product. I'm one that needs to see what I'm suspose to end up with. Thanks again for the great reading. I love Paula Deen, and I love to bake.I am also pretty good at it.Most of the recipes are very tempting,but I do not like to use cake mixes and other pre-packaged food in my baking.I expected better from her. Also, I have made 2 things so far.The orangebrownies, and the pumpkin squares.While the brownies were very tasty, the baking time was way off, and the glaze is very thick - way too thick to pour, as she directs in the recipe.It's a very simple recipe, and I am sure that it was a mistake in the instructions. The pumpkin cake was very good, but that was because of the icing.The cake itself was bland and tasteless, and crying out for additional spice and butter instead of corn oil.I belive that a cake needs to stand on its own, and the icing just enhances it. That said, I'll still use the book, but I am aware that I will have to make a lot of adjustments. Four new, exciting titles build upon the vastly popular, collectible Food Made Fast series from Williams-Sonoma (Desserts, Simple Suppers, Small Plates, & Vegetarian). Featuring delicious food that is simply prepared, each book is designed for today's busy but taste-conscious cook. Welcome solutions make it easy to plan ahead and cook healthy, home-cooked meals in as little as 20 to 30 minutes, so your family can enjoy great-tasting dishes every day of the week, and you can enjoy more time with your family. Love all these books. There are often few ingredient and it is as promised quick to make and incredibly delicious. It made me love cooking again and was able to do with an infant. I fully admit that I am one of those people that get inspired to bake or cook something based on the pictures, so it's nice to see a beautiful shot of each recipe in this book. I made the lemon tart with rasperries and it was delicious..the crust came out perfect and it was easy to make.The caramelized bananas with coconut are next! 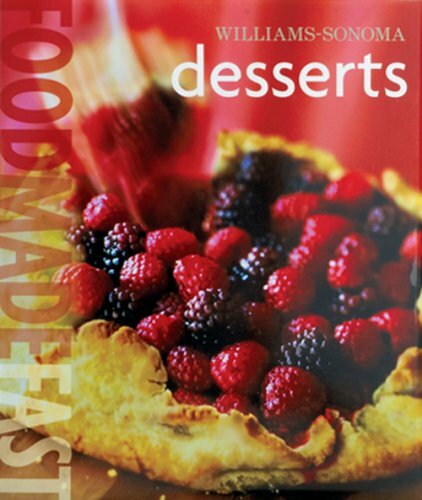 Featuring an impressive diversity of recipes by award-winning pastry chef and cookbook author Elinor Klivans, "Food made Fast: Desserts" is a compilation of fabulous, elegant, sophisticated, but thoroughly 'kitchen cook friendly' delicacies that would crown any meal, celebrate any occasion, please any palate, and satisfy any appetite. Each of these desserts is beautifully illustrated with the full-color photography of Jeff Tuck and Kevin Hossler. The individual desserts are organized into three main sections: 30 Minutes Start to Finish; 15 Minutes Hands on Time; and Make More to Store. They range from an Italian Affrogato; Pears Poached in White Wine; Chocolate Mocha Mousse; and Plum Sorbet; to a Lemon Pudding Cake; Blueberry Streusel Galette; Hot Fudge Parfaits; and a Chocolate Icebox Cake. Of special note are the occasional 'Cook's Tips' sidebars; 'The Smarter Cook' commentary; and 'The Well-Stocked Kitchen' advisory. Published under the general editorship of Williams-Sonoma founder Chuck Williams, "Food Made Fast: Desserts" is highly recommended for community library cookbook collections in general, and the personal reference collections for time-stressed family chefs in particular! Everybody loves dessert, but nobody loves the calories. 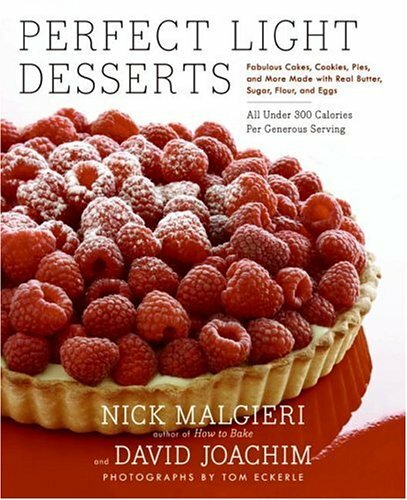 Perfect Light Desserts offers recipes for desserts rich enough to satisfy any sweet tooth -- but with sensible calorie counts. The results are nothing short of spectacular, with desserts that range from devil's food cake (complete with fluffy icing) to a lemon custard highlighted with a colorful raspberry sauce. Old-fashioned American favorites such as hermits mingle with sophisticated treats like rum raisin semifreddo and white chocolate raspberry tartlets. Best of all, while these desserts are low-calorie, they are high in flavor. Moist coconut poppy seed coffee cake, juicy blueberry pie, and fudgy brownies don't taste like “diet desserts”; they simply taste great. All of the recipes here achieve great flavor without resorting to artificial sweeteners or synthetic substitutes. The recipes use moderate amounts of real butter, sugar, flour, and eggs in perfect proportions. Every recipe includes a complete nutritional analysis as well as serving and storage notes. Everybody loves dessert, and now no one has to go without it. I think this is a great book.It's perfect for those who enjoy desserts but don't want to over indulge.Nobody can tell that they are lighter recipes, which is great.My only complaint is that the book I received is missing a page, which means I can't make one of the recipes...It makes me not want to order from Amazon again. Like other reviewers, I have only had great success with all attempted recipes from this book.It has earned my trust - I know that the time and ingredients that I put into baking these desserts will be worth it.High quality all around! It is nice to find a book that is light and uses real ingredients. I do not like using any "fake" stuff when I cook. I have by now made six of the recipes in this book, one of them (the brownies) three times. Most cookbooks that I keep have an eight in ten success record. This book, however, is ten out of ten. The brownie recipe is one of the best I've ever tasted and certainly the best I've ever made. The fruitcake ended up being the highlight of a recent holiday potluck. The coconut poppy seed cake was the perfect birthday cake, and the reason I'm reviewing the book at this moment is that I handed a slice of spice cake to a co-worker who praised it for a good three minutes. I always knew Malgieri was a great baking book author. I didn't realize how great until just this moment. I haven't had a failure yet from this book, and I can't even say that about classics like "The Joy of Cooking." Bravo, Mr. Malgieri! p.s. 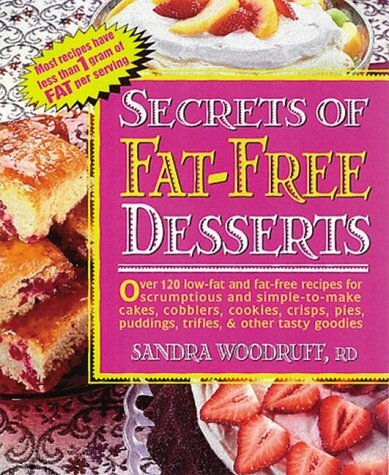 Buy this book if you want to make some scrumptious, lower fat and calorie, desserts. A large number of excellent recipes. A must have for those who enjoy culinary adventures. Very nice collection of Irish baking. Buy It! 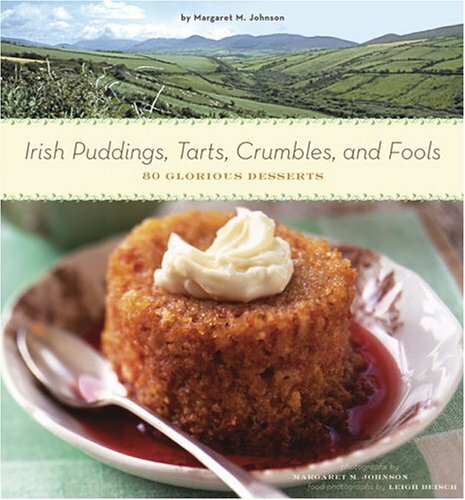 `The New Irish Table' and `Irish Puddings, Tarts, Crumbles, and Fools' by Irish-American culinary journalist, Margaret M. Johnson who seems to provide low end books covering Irish culinary practice, beginning with her `The Irish Heritage Cookbook', also from Chronicle Books. The middle ground, being the `Julia Child' for Irish cooking is Darina Allen, along with husband, Tim Allen and mother in law, Myrtle Allen, all of the Cork culinary powerhouse, Ballymaloe House and Cooking School. The high end of modern Irish cooking is held by Irish-American culinary academician and chef, Noel C. Cullen. The ethnographic corner of Irish / Celtic foodways is filled out by `Celtic Folklore Cooking' by culinary writer and folklorist, JoAnne Asala of Chicago. There are many more Irish cookbooks to cover between now and St. Patrick's Day, but this pretty much covers most major points on the culinary compass for Irish cooking. `The New Irish Table' and Cullen's `Elegant Irish Cooking' complement one another pretty well, as they both present recipes from modern Irish hospitality centers. The difference is that where Johnson is covering pubs and `bed and breakfast' style eateries, Cullen is covering dishes from Michelin one and two star restaurants in Ireland, as well as many of his own creations as a working chef, before he took up teaching at Boston University. Between these two featured books, Johnson's Desserts book is a much more valuable addition to your cookbook collection, as it includes a lot of fancy and holiday desserts which I have not seen in any other good book on Irish cooking. The best thing about this book and its companion is that like a lot of Chronicle Books, it seems to be on a fast track to the Bargain Book table, both real and on-line. That means that at half price, this book is a real bargain for the cookbook collector with a genuine interest in dessert baking. Anyone familiar with English cooking will recognize in the first chapter a wide range of desserts which the Anglo-Irish all lump together under the name of `pudding'. Actually, most puddings remind me a lot of French Toast, more properly called `pain perdu' by the French. They are all different ways of combining day old bread, custard, dried fruits and the like into a treat for the sweet tooth. Puddings and tarts, together, form a collection of dishes very familiar to those who know English sweets. Crumbles and Crisps and Fools and Flummeries all seem remarkably like a style of dessert which is very popular in the United States and commonly associated with both the Pennsylvania Dutch and southeastern and south central styles of cooking. In Ireland, as in the United States, they are all primarily ways of combining stewed or jellied fruit with oats, milk and perhaps some custard. The thing that distinguishes `fools' from other similar desserts is the fact that they are made with gooseberries. A gooseberry, according to my `Berry Bible' illustration, looks a lot like a current, and just a bit like a blueberry, and seem to be common in the United States only in the northern west coast. The breads and cakes chapter visits the most widely familiar realm of Irish baking, the world of soda breads and scones. This realm is covered much better in Tim Allen's `The Ballymaloe Bread Book', but the last chapter in this book makes the whole book worth the budget price of admission. This last chapter is a bonanza for those looking for something interesting to bake for Christmas, especially if you are fond of confections which include a bit of stout or Irish whiskey in the ingredients. This chapter brings the tired old fruitcake into a whole New World of cakes, puddings, ice creams, breads, mince pies, and cider sauces. Small Bites with 9 recipes for crackers, tartlets, pates, crostini, cheese bites, and chutneys. Starters with 15 recipes for soups, salads, souffles, charlottes, sauces, and sabayon. Main Courses with 16 recipes for fish, duck, chicken, lots of pork, lamb, venison, rabbit, and pheasant. Side Dishes with 13 recipes of old standards such as colcannon, champ, boxty, cabbage, turnips, and leeks. Sweets with 17 recipes for puddings, custards, brulees, cakes, tarts, cobblers, and crumbles. All in all, if you already have one or two books on Irish savoury dishes and you get Johnson's dessert book, this volume becomes largely redundant. A lot of the sidebars between the two books are the same and the `Irish Table' simply confirms everything I already know about the heavy Irish use of apples, pears, berries, dairy, beer, whiskey, pork, and lamb. Since you can get this cheap, I will recommend it as a small, inexpensive addition to your Irish cookbook collection. It may, however, be the first in line for regifting if you already own a few Irish cookbooks.